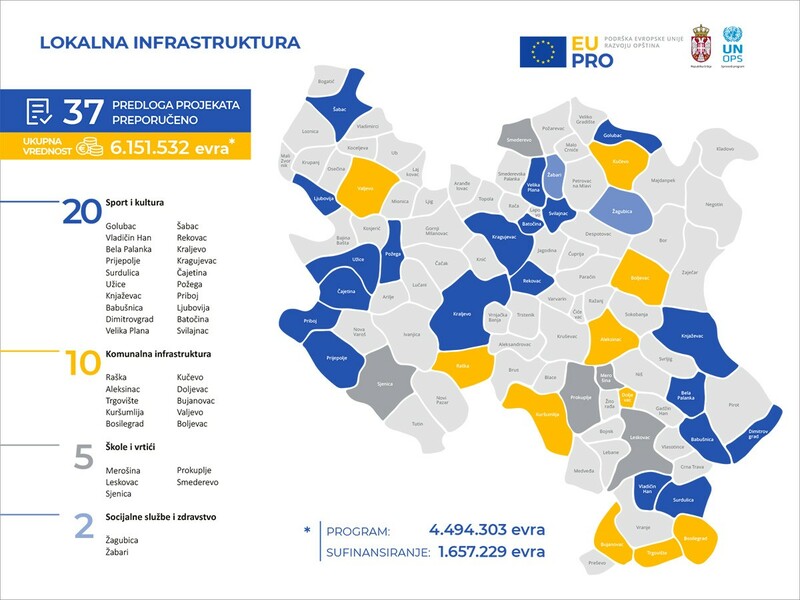 The European Union, through the EU PRO development programme, will finance with the amount of four and a half million Euros the realisation of local infrastructure projects in 37 local self-governments in the region of Šumadija and Western Serbia, and the region of Southern and Eastern Serbia, with the aim of improving the quality of life of the population. The projects, approved by the Programme Steering Committee on the basis of administrative, programme, and technical evaluation of the proposals, will primarily improve the conditions in sport and cultural facilities, schools and kindergartens, health care and social protection institutions, while also improving the communal infrastructure, which will particularly contribute to better living conditions of the vulnerable groups. Therefore, the population, particularly children and youth, of Bela Palanka, Babušnica, Batočina, Čajetina, Dimitrovgrad, Golubac, Kragujevac, Kraljevo, Knjaževac, Ljubovija, Priboj, Prijepolje, Požega, Rekovac, Surdulica, Svilajnac, Šabac, Užice, Velika Plana, and Vladičin Han, will obtain adequate conditions playing sports after the reconstruction or construction of sport and cultural facilities, while the cultural content at local level will be improved. In Leskovac, Merošina, Prokuplje, Sjenica, and Smederevo, learning and working conditions in schools and kindergartens will be improved, while the special focus will be given on energy efficiency and safety of the facilities. The communal infrastructure, i.e. the water supply systems, sewage networks and public lightning will be improved in ten Programme municipalities as follows: Aleksinac, Boljevac, Bosilegrad, Bujanovac, Doljevac, Kučevo, Kuršumlija, Raška, Trgovište, and Valjevo, while the Social Work Centre in Žabari and the Health Centre in Žagubica will be reconstructed with the support of the European Union. By supporting the realisation of these public infrastructure projects, the European Union directly contributes to a better life of the population through improving the quality and access to communal, health and social services, as well as better conditions for the education and growing up children and young people. 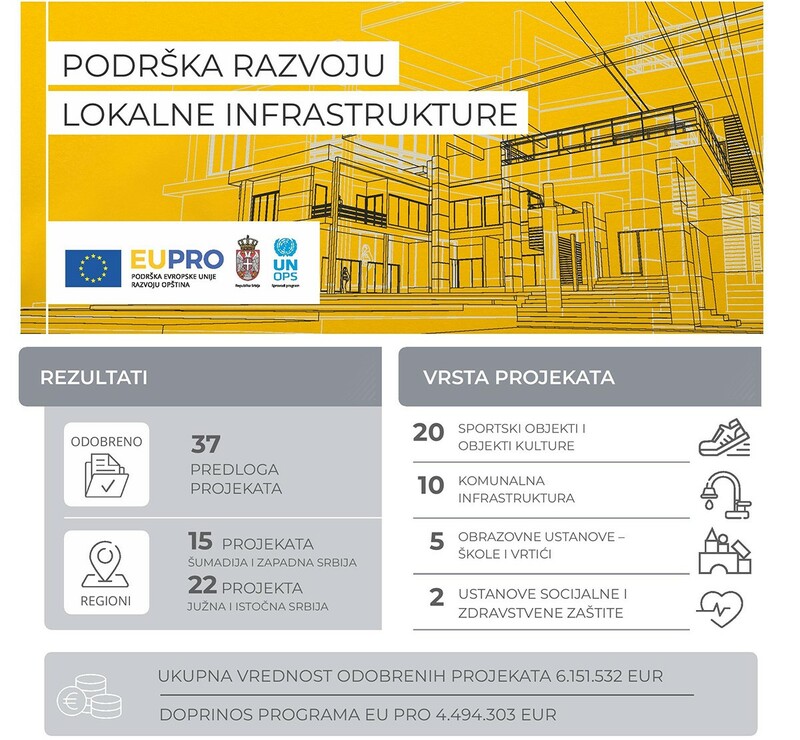 A total of 46 project proposals were submitted for the Public Call, which was open from 26 April to 29 June 2018, whereas one of the necessary conditions for applying was the construction permit and financial share of minimum 15 percent of the project value. Therefore 37 local self-governments with the projects approved will participate in the realisation with 1.6 million Euros, so that the estimated overall budget of all the projects amounts to 6.1 million Euros. During the realisation of the projects there will be a special focus on the implementation of the good governance principles that will help local self-governments to be more efficient and transparent in their everyday work while the citizens` participation should be increased. The list of approved projects is available on the Programme EU PRO website here.